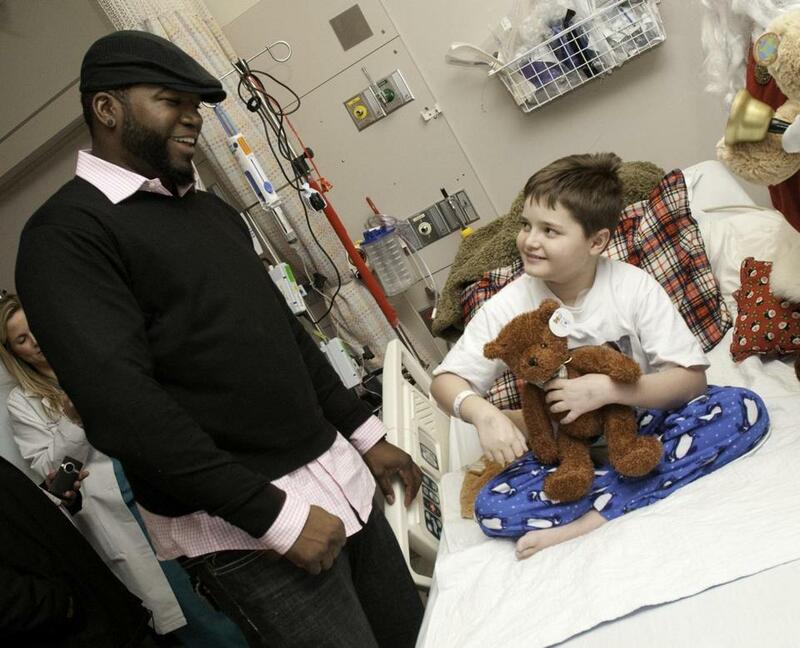 David Ortiz at MassGeneral Hospital for Children. The realization that he could help, had to help, occurred six years ago. Red Sox slugger David Ortiz made a charity appearance at a hospital in his native Dominican Republic, and he was dismayed by the lengthy waiting list of children in need of lifesaving heart surgeries. He created the David Ortiz Children’s Fund, which has raised some $2 million that has paid for more than 200 heart surgeries in the Dominican Republic. He has also expanded the fund to support pediatric care in New England. Major League Baseball recognized Ortiz’s dedication to children’s causes in October by bestowing on him the league’s Clemente Award, in honor of the late Roberto Clemente, a 12-time All-Star who died in a plane crash in 1972 while delivering supplies to earthquake victims in Nicaragua. Ortiz is the second Red Sox player in a row to win the award: Pitcher Tim Wakefield was recognized last year for his work on children’s causes. The father of two girls, 14 and 10, and a 7-year-old boy, Ortiz said he particularly wanted to help children. His work has had an undeniable impact, says Susan Rickman, chief executive of the World Pediatric Project, a group that organizes programs for pediatric care in many Caribbean countries. When Ortiz found out thousands of kids would be on a waiting list for surgery and more funding was needed, he “stepped in and said ‘I can help there,’ ’’ Rickman says. In 2009, Ortiz reached an agreement with the MassGeneral Hospital for Children to support children in need of care in New England. With an annual golf tournament in the Dominican Republic, he has raised money for both organizations, and he has made donations himself. Eugene Mahr, senior director of development at MassGeneral Hospital for Children, recalls the kids’ excitement as Big Papi walked through the halls of the pediatric unit last year handing out teddy bears just before Christmas. Milton J. Valencia is a Globe reporter. He can be reached at mvalencia@globe.com. Follow him on Twitter @MiltonValencia.